While many of us know to be careful when approaching a new dog, we can sometimes forget when approaching a new puppy or dog. It can be hard not to run over and try to pet the cutie, but this natural instinct could lead to a dog bite or attack. Even dogs you know might be in a prickly mood and not feel like company. It’s always best to approach a dog calmly and safely to avoid an unpleasant encounter. 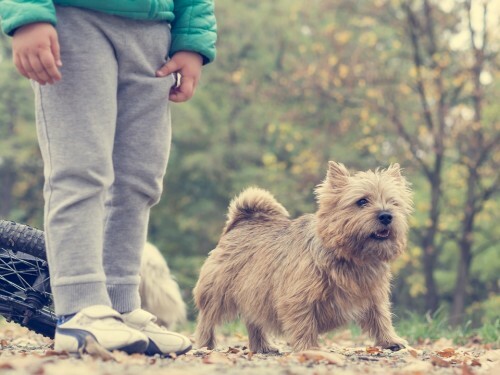 Of course, if you encounter a stray dog that is off leash, the best thing you can do is stay away from the dog, unless you are a dog trainer or part of a rescue group that has experience with stray dogs. When approaching a new dog, if you let the dog approach you first, it makes him feel in charge and that you aren’t a threat. The dog might lick you, sniff you, think that you are a threat and bark or growl, or continue sniffing and act like he is asking for attention and love. Stay calm and cool and slowly pet the dog. If you approach a new dog head on, it could be mistaken as an affront. Most dogs don’t like the idea of feeling as if someone is watching or staring at them. Dogs tend to approach others in curves, whether approaching a human, another dog or other animals. The best way to approach a dog is to keep your side towards the dog so he or she will not feel threatened and uncomfortable. When approaching a new dog, it’s best not to put your hand or even fist near him. The dog might see this as an affront or attack and react accordingly. Keep your hands where they should be and give the dog a little time to adjust before petting him. Always act calmly towards the dog and don’t make any quick moves. At first, try to avoid looking at the new dog directly in the eyes as this could imply that you are a threat to him. Dogs are usually very territorial and don’t want their personal space invaded. Move slowly and do not lean forward or have you head close to the dog. The general rule of thumb (or paw!) is not to pet the dog on the top of the head or over the head. Instead, pet from the bottom of his head, under the chin, or even the chest area and the sides. And then he or she might just love you! Most dogs are very friendly, but it’s always best to keep these tips in mind and approach a new dog slowly, calmly and carefully. And, then you could be best friends! And it’s best safety practices to always have your dog on a leash. You can find some here from our friends at Chewy!